PEBBLE BEACH, Calif. (AP) Rory McIlroy can't imagine what his life would be like without golf, and now he wants to cultivate his joy of the game with as many people as possible through a partnership with NBC Sports Group. McIlroy on Tuesday launched "GolfPass," a direct-to-consumer subscription program that will deliver more than just exclusive content from the four-time major champion. The idea is to get customers more involved by using the vast resources at NBC Sports Group with tee times, instruction, its video library, travel and shopping. "Whenever I started to talk to guys with Golf Channel to do a partnership to try to make people's experience in golf better, I was all for it," McIlroy said before a media blitz in New York. "I've had nothing but good times and good experiences playing this game." GolfPass costs $9.99 a month or $99 a year, and there are plans to make it available in the U.K., Ireland and Australia. The membership is built around five pillars - play, learn, watch, travel and shop. One of the immediate perks for members is a free round of golf each month at any of the 7,000 golf courses in 26 countries that are part of the "GolfNow" program at Golf Channel. Those courses include Royal Portrush, Pasatiempo Golf Club in California and the TPC Deere Run. Members will have access to more than 4,000 on-demand instruction videos involving elite coaches and players, a video library at Golf Channel that ranges from David Feherty's golf shows to competitions that NBC originally broadcast, along with deals for travel through "Golf Advisor" and discounts in equipment and apparel through TaylorMade, which is a GolfPass partner. "We're creating a product that's going to make it easier and more fun to play the game," said Mike McCarley, president of golf for NBC Sports. McCarley said the discussions began two years ago when McIlroy's management team had a technology-based idea, and before long officials figured out how to interconnect Golf Channel properties like GolfNow (a tee time service), Revolution Golf (video instruction) and Golf Advisor, which involves rating golf courses and travel destinations. What impressed McCarley was how the 29-year-old from Northern Ireland made a connection between this product aimed at consumers and Arnold Palmer's vision of starting Golf Channel in 1995. "To try to carry forward what Arnold started 25 years ago, bring it into the 21st century with GolfPass ... you can never fill shoes that big, but to try to carry the torch in some way is a great honor," McIlroy said. "It's about me trying to give something back to a game that has given me so much." Palmer left indelible memories with McIlroy when he first played at Bay Hill in 2015 as No. 1 in the world. McIlroy approached The King's table at lunch, and Palmer asked if there was anything he needed. McIlroy replied, "Mr. Palmer, thanks to you, I have everything I could ever need in my life." According to those at the table, Palmer began to get tears in his eyes. McIlroy won the Arnold Palmer Invitational last year. It's the second time in two months that a prominent player began a direct-to-consumer product. Tiger Woods signed a deal with Discovery's "GolfTV" for exclusive access to Woods and original content. McIlroy is doing a docuseries called "My Roots" on his rise in golf, and he plans to co-host a podcast with Carson Daly. But it's not all Rory all the time. Other content includes players, analysts and celebrities discussing how they play some of the toughest holes in golf, along with other athletes talking about their daily routines. "I'll be on there a lot," McIlroy said. "It will be hard to miss me." Two milestones are within reach for Phil Mickelson, who began the year with a runner-up finish at the Desert Classic and a missed cut in the Phoenix Open. Mickelson is a little more than $11.2 million away from joining Tiger Woods as the only players to crack $100 million in career PGA Tour earnings. Mickelson, who turns 49 this summer, made roughly that much in his last three seasons, and he has remained remarkably injury free for nearly his entire career. The big one is 50 - not his age, but the number of PGA Tour victories. Only seven players have done that. Mickelson all but guaranteed he would reach 50 after he won the Mexico Championship last year to end a drought of nearly five years. It was his 43rd career victory. But he had only one top-10 finish the rest of the season, and that has brought a dose of reality to him. "I've got to be honest in my assessment of winning seven more times," he said last week. "It's certainly my goal and something I'm striving for and yet I know it's not going to be easy. So I don't have the same 100 percent `I'm going to do this thing.' I'm a little more realistic because I really thought I was going to pick off two or three more at the end of the year and I played terrible." But he says he had a good offseason, picked up more speed and with improved putting, "it's hopefully going to lead to a special year." Four women from the top 11 in the World Amateur Golf Rankings have accepted invitations to play in the LPGA Tour's first major of the year, the ANA Inspiration. That typically was an easy decision, but that was before the creation of the Augusta National Women's Amateur, which will be held the same week (April 4-7). The 30 women who make the cut will play the final round at Augusta National on the Saturday before the Masters. Frida Kinhult of Sweden (No. 2 in the amateur ranking), Patty Tavatanakit of Thailand (No. 3), Albane Valenzuela of Switzerland (No. 6) and American teenager Rachel Heck (No. 11) chose the ANA Inspiration. A final spot has been reserved for the winner of the ANA Junior Inspiration, to be played the week before. "I am so excited, and I can't wait to get to Rancho Mirage," the 17-year-old Heck said. "This major has so much history, and I am honored to be following in the footsteps of my role models who played in ANA Inspiration on amateur invites." The Augusta National Women's Amateur has six of the top 10 in the amateur ranking, including top-ranked Jennifer Kupcho. Patrick Reed is the fourth American to receive lifetime honorary membership on the European Tour. The others were Arnold Palmer, Jack Nicklaus and Tom Watson. The last American to get the honor was Nicklaus in 2014, nine years after he stopped playing professionally. ... Jordan Spieth fell to No. 21 in the world ranking, his first time out of the top 20 since the end of his first year as a professional in 2013. ... Gary Nicklaus, the 50-year-old son of Jack Nicklaus, received a sponsor exemption to make his PGA Tour Champions debut this week at the Oasis Championship in South Florida. Rickie Fowler (74) is the first player this season to win a PGA Tour event with a final round over par. That happened twice last season - Webb Simpson at The Players Championship (73) and Tiger Woods at the Tour Championship (71). "I really don't want to have to go and win tournaments that way." 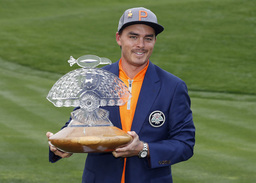 - Rickie Fowler, after making a double bogey and triple bogey in the final round of his two-shot victory in the Phoenix Open.